Klei seems not to have lost the love for exuberant explorers, flowing hair and a firearm in his hand. Except that Wheeler isn't exactly a beautiful character... I would have called her Wheller, it seems to me more like a name. Obviously the real problems of Wheeler are others, but I don't want to discuss she now :'D I said, since Klei still has his love for the figure of an explorer, why not expect a similar figure on DST soon? 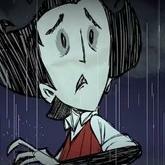 I know, it is unlikely that Klei will resurrect Warbucks from the grave... but dreaming costs nothing, right? Obviously it should be heavily reworked, but I think we all agreed that he needed it from the start, didn't he? Here's how I'd change Warbucks on his return to DST: Health: 100 Hunger: 150 Sanity: 200 Warbucks loves his wealth: he loves gold; he has a bank of his own in London, where he dives into money like a flashfish, digs tunnels like a mole and throws it over his head like a shower. Warbucks recovers +1 sanity per minute for every 10 gold nuggets in its inventory, up to a maximum of +10 per minute. Beast hunter: Warbucks is a hunter; he loves the thrill he feels while hunting big animals with his trusty riffle. In his villa in London he has a room dedicated exclusively to hunting trophies, proof of the triumph of man over wild nature! Warbucks starts with a rifle. You can craft it with gears, wooden boards and gold. Only Warbucks can craft bullets, so without at least one Warbucks in the squad it is not possible to run the rifle for long. Bullets are crafted with gunpowder and rock. Warbucks regains sanity when it kills a creature, based on the creature's life points (surely only +1 sanity for creatures under 100 life points); this does not apply to pigs, bunnyman or other players (they are too "human" and Warbucks don't finds it gratifying to kill them). Warbucks can craft trophies with the remains of some animals: he can exchange these trophies with the pig king for rewards. (or use them as decorative objects) Example: Dragon Trophy (with dragonfly skin and monster meat): the Pig King exults jubilation and gives Warbucks 1 gem of every color of the rainbow. Warbucks is a veteran of exploration: as a young man he was already marching in the name of the queen in the heart of black Africa! He had to learn to make his resources last: all the tools that Warbucks uses lose half of their durability. Disadvantages: Warbucks is now used to his life of comfort and wealth in London, as well as being old and frail. He has about 33% less life; the food that is not prepared in the pot makes him disgusted, making him suffer a penalty of -15 to the sanity. As you can see, this new Warbucks have the soul of the original, expanding the possibilities and giving it a strong utility within a team. "How many beautiful people, in these desolate and full of mystery lands! I say, is it time to found a new colony in the name of great England?" -Warbucks on DST.